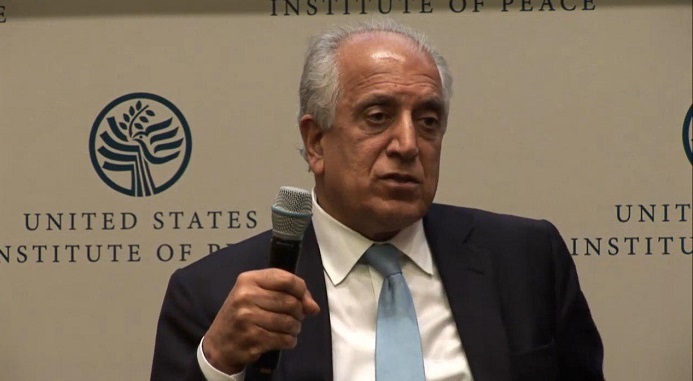 US Special Representative for Afghan Reconciliation Zalmay Khalilzad said in his address at the US Institute of Peace (USIP) on Friday, that to achieve a peace agreement, a significant number of issues have to be dealt with. “We have tried to develop a long agenda of issues that must be addressed. Initially, we have focused on two issues, one being the issue of counter terrorism and the other being that of forced withdrawal,” he said. The United States is seeking a peace agreement and not an agreement to withdraw its troops from Afghanistan, Khalilzad clarified. This comes just weeks after US initiated direct talks with the Taliban, wherein the two agreed on a framework of peace agreement; Khalilzad said that these were just a few steps in the direction of peaceful reconciliation of the conflict in Afghanistan and that they still have have a long way to go. “And this cannot be achieved without the help of regional players, in particular Pakistan”, Khalilzad said while adding that his overall goal is not to seek out withdrawal agreement but the peace agreement. “After many conversations, we have reached an agreement in principle with the Taliban on a framework that would provide guarantees, and an enforcement mechanism that no terrorist group, international terrorist group or individuals would be able to use Afghanistan, the areas that they control and should they be part of a future government; against the United States as allies and others,” Mr. Khalilzad described. 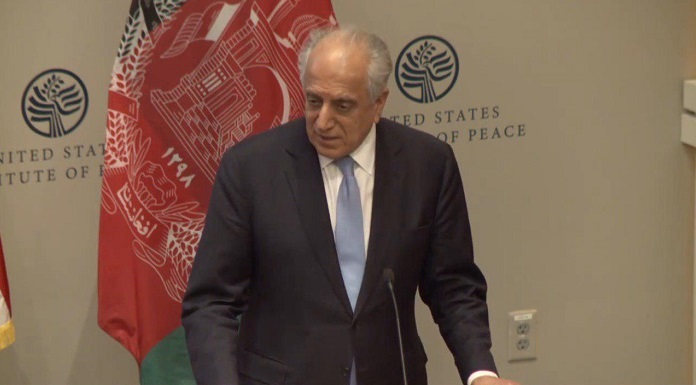 Khalilzad assured that US officials will engage with Taliban further to enforce and “flush out” commitments that the group has made. “Our hope and expectation is that once intra-Afghan dialogue begins, which is our key objective, that these parallel discussions will be brought together,” he said, and “Even if we achieve success on these two issues [of counter-terrorism and troop pullout], we make further progress. A peace agreement would not be, immediately or shortly achieved in the foreseeable future without a comprehensive agreement on other issues,” he added. The Afghans, he asserted, must talk to each other and come to an agreement about the future of their country. “All sides that I’ve talked to, tell me that they’ve learned lessons from the past. That previous governments whether it was a Taliban government or others that dominated Afghanistan have imposed a unique vision by force on others and have been a failure. So, the time has come, they say, for an inclusive dialogue leading to an inclusive peace” Khalilzad informed, as he acknowledged that the task is not easy. 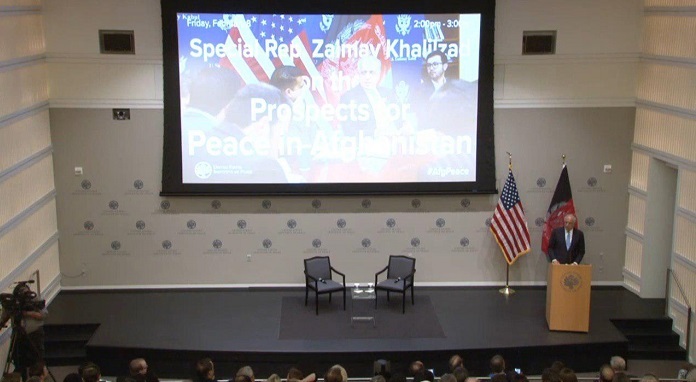 Khalilzad also commented that U.S. has offered to do what it can to be helpful if help is needed, but it’s for the Afghans to decide and it’s for the Afghans to have the conversations, to negotiate with each other, “The U.S. cannot be a substitute for decisions that they must make”. “We will speak loudly and clearly for the values that we have, the values of human rights, values of freedom, of the press, women’s rights, all that we stand for. We’ll make sure they understand that for having a positive relationship in the future with the United States, those values must be respected, those values must be responded to” he added. Khalilzad also said that the message the Taliban has given him is that they understand they cannot go back. “We don’t trust the words of any of the protagonists as such anywhere, but we will do what we can to facilitate it. We would be helpful and be watchful”, he said. Mr. Khalilzad said he would ideally have the peace deal before the upcoming presidential elections in Afghanistan. Noting that there is reluctance on the side of the Taliban to talk directly with Afghan Government and negotiate the future. But he expressed hope that he will dedicate his time to help overcome that hurdle. In addition to the United States, he said that the region has an important role to play in Afghanistan. “The roots of the conflict in Afghanistan lie not only in Afghanistan but also in the broader region. I have conveyed to the regional players that we seek their cooperation, their participation, their facilitation to assist Afghanistan to come to the negotiating table and to make an honorable, just peace with each other” he said. Mr. Khalilzad thus explained that he has talked to all the neighbours of Afghanistan with some exceptions, but also informed they have not yet agreed on a formal framework for regional participation. “There are a number of regional initiatives that are out there. We look forward to coming to some understanding on the shape of a regional group or a gathering that could facilitate and participate in the finalization of the peace agreement,” he said. “But we don’t have to wait until then for regional players to play a positive role. They can already play a positive role,” he added. Mr. Khalilzad said the timing of a peace settlement from American point of view was-“sooner the better”. “It will be better for Afghanistan if we could get a peace agreement before the election, which is scheduled in July,” he said. “We would prefer to see a peace agreement before July to bring the Taliban also into the process so that the peace agreement would act as a facilitator for peaceful election or a framework for proceeding with regards to the future of Afghanistan”, he added.